Few doctors realize that their work is often about human rights. A few years ago Flavia Bustreo, then Assistant Director-General of WHO, and Paul Hunt, the first UN Special Rapporteur on the right to the highest attainable standard of health, wrote to me to ask for some case studies of our community women’s group programs in Asia and Africa. It hadn’t occurred to me that mobilising women through participatory learning and action groups might address human rights in a fundamental way. But after reading the principles underlying human rights-based development, I learned that women’s groups might address almost all of them: how to build resistance to non-discrimination and inequity, how to participate in decision-making, how to hold authorities and services accountable (through the three pillars of monitor, review, and remedy), and how to preserve the interests of the mother and child. The only exception was the principle of the rule of law, over which remote rural community groups would have little say. 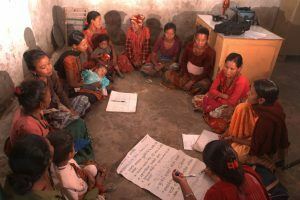 Below: Women’s group in Makwanpur, Nepal. Community engagement and participation was at the heart of the Alma Ata Declaration in 1978. The fourth article of the Declaration states that “people have the right and duty to participate individually and collectively in the planning and implementation of their health care”. The seventh article states that primary health care “requires and promotes maximum community and individual self-reliance and participation in the planning, organization, operation and control of primary health care”. But how can these lofty principles be built into real-world programs, especially for poor people at the margins? Does participation per se have an impact on health? Or is it a ‘shibboleth’ in the modern world of medicine that has little value. Indeed, some social scientists have critiqued ‘the tyranny of participation’. Over the past 20 years I have worked with superb teams in Bangladesh, India, Malawi, and Nepal to evaluate the impact of community groups on outcomes as varied as maternal and newborn death, breastfeeding and dietary diversity in infancy, postnatal depression, and latterly, pre-diabetes and diabetes. To our considerable surprise the results greatly exceeded expectations. The method we used was participatory action and learning using what the Oxford anthropologist Robin Dunbar calls ‘sympathy groups’.1 He regards human groups as a tripling hierarchy, from the survival clique of the family (perhaps five people), the sympathy group (15), the overnight band (50) to the Dunbar number of 150, the limits of our social brain. Members of sympathy groups have a common interest: they are beneficiaries, enablers, or neighbors. Groups agree a focus for action, meet regularly, build trust and work on strategies to solve the problem. Seven large population randomized trials showed that where women’s groups discussing mother and infant care involved at least 30% of local pregnant women the newborn mortality rate fell by one third compared to control villages.2 In other trials we have shown reductions in postnatal depression and improved infant feeding and weight gain. And, from qualitative data, we see greater solidarity and many spin-off group activities beyond health concerns, such as loans, help in a crisis, water protection, kitchen gardening and tree planting. Recently we’ve finished another trial exploring the role of women’s and men’s groups in cutting the risk of pre-diabetes and diabetes in Bangladesh. The results will be published shortly but suggest further significant and impressive benefits. However, participation is certainly not a panacea, nor is it without criticism. Critics suggest that participatory projects fail to make lasting and meaningful social change, engage poorly with underlying power and politics, and place too much emphasis on voluntarism and using ‘local’ solutions to divert attention from, and protect, disempowering elites. Non-government organisations come in for particular criticism. Their role is described as a confusing mishmash of the public, private, and civic. Their funds from external donors may compromise their allegiances and they weaken the social contract between state and citizen. NGOs are accused of being neo-imperialist, bringing their own perspective on how the ‘third world’ should be managed. Participation is not a panacea, but neither is it a placebo. For participation to work, the process must be open-ended, radical, and engaged with broader aspects of change than behavior. Participation does not substitute for citizenship. If participation is an afterthought in an essentially technocratic aid program it will not be a success. If it’s the first and most essential part of an integrated program to bring the benefits of better services and technologies to people, it’s much more likely to be embraced. Given the history of academic disputes over the uses of power and participation, rigorous assessments of interventions through proper evaluation seem all the more important, with hard impact measures analysed within the social and political context. And taking participatory community programs to scale is important, deserving the same attention and scientific scrutiny we give to immunization and screening programmes. In India women’s groups addressing maternal and infant care have been scaled in two states with over 150,000 groups active. The Federal government has asked for the approach to be scaled in eight priority states. Monitoring impact will be important. Giving people a voice in conversations about their health is a right not an option. In our western, over-individualised world of urban isolation, mobile screens and self-help, it’s a lesson we might learn. We should explore new participatory and social approaches to our pandemic of obesity, inactivity and non-communicable disease. Forty years on, Alma Ata is remembered for its bold and comprehensive vision of health that placed participation and engagement at its heart. We can use the creativity of sympathy groups to find non-linear solutions to non-linear and complex problems. Our groups can go viral if we create the conditions to nurture them, because they touch a deep impulse in the human psyche. His book ‘The Social Edge. The Power of Sympathy Groups for our Health, Wealth and Sustainable Future’ is published by Thornwick Press, available from 5 November 2018. Dunbar, Human Evolution. London: Pelican, 2014. Prost, T. Colbourn, N. Seward, et al. “Women’s Groups Practising Participatory Learning and Action to Improve Maternal and Newborn Health in Low-Resource Settings: A Systematic Review and Meta-Analysis.” The Lancet 381, no. 9879 (2013): 1736-46; C. G. Victora and F. C. Barros, “Participatory Women’s Groups: Ready for Prime Time?” The Lancet 381, no. 9879 (2013): 1693-94. Hickey, and G. Mohan, Participation: From Tyranny to Transformation: Exploring New Approaches to Participation in Development. Development In Practice Oxford. 15, no. 5, (2005): 717. Kindle edition 2013. Mishra, “Which India Matters?” The New York Review of Books 60, no. 18, 21 November 2013. Dreze and Amartya Sen. An Uncertain Glory: India and Its Contradictions. Princeton, New Jersey: Princeton University Press, 2015.